Giannis Bourousis is already preparing for another big tournament with the Greek national team. Greek national team captain Giannis Bourousis takes pride on the fact that not only his squad has punched a ticket to the 2019 World Cup, but that they march forward with an unscathed, 9 – 0 record in the Qualifiers. 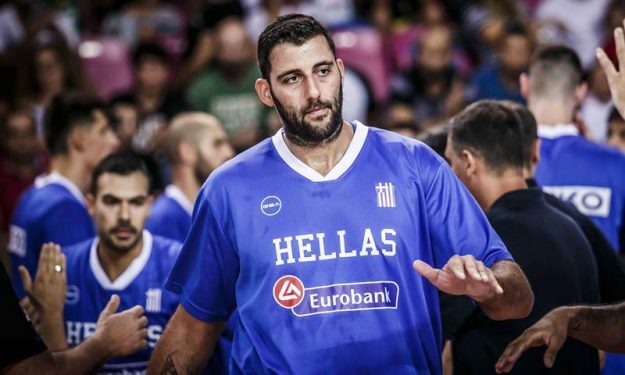 In fact, following Thursday’s and Friday’s games, Greece is the only undefeated team in the tournament and the veteran big admits being surprised with this run. “To be honest, I didn’t expect to have an undefeated record all the way from the beginning, and many people didn’t believe in this team. But we shouldn’t think about what we have been told before. “We have to stick to the results which have brought us to the World Cup. The most important thing is that these guys managed to get the ticket for the World Cup,” Bourousis said to FIBA. For Bourousis, who averages 16.0 points, 6.7 rebounds, 4.0 assists, 1.7 steals and 0.9 blocks so far in the Qualifiers, advancing to the World Cup early is quite the success given that other traditional European powers haven’t secured a spot in the championship yet while defending EuroBasket champion Slovenia has been eliminated. “Greece will be in China, playing in the World Cup. European champions Slovenia will not be there. Other powerhouses in Europe are struggling. Greece is going there, with already nine wins. Can you imagine that? It’s huge,” Bourousis added.